It’s no big secret that choosing your baby’s formula can be hard. Honestly, it can be downright intimidating with all of the different brands out there from big companies that made formula and even from big box stores that make their own to rival those of other formula companies. At some point, you’re bound to compare the store brand vs. name brand. Or, in this case, Parent’s Choice vs. Enfamil Formula. Both are made in a variety of different options to accommodate almost every baby’s needs as far as colic, gas, and fussiness go. They are also both highly nutritious and offer babies all the nutrients that would get from breastmilk and will need for the first year. But, you guessed it, there are some differences that set the two formulas apart from each other. For one, Parent’s Choice is the official Walmart store brand of formula. There is nothing wrong with purchasing store brand formula and tons of thrifty parents opt for store brand formulas and even baby foods. Enfamil, on the other hand, is a well-known formula company that is focused on formula and formula alone. This could leave more room for quality, whereas some parents might consider Parent’s Choice to have a slightly lesser quality since it comes from a company that produces more than just formula and baby needs. However, overall, Parent’s Choice is the more affordable option in most cases and that can be a big factor for some parents. Obviously, the cost is always a factor when thinking about baby products, but the formula can certainly add up. If you aren’t breastfeeding, then te formula is the only way your baby is getting his or her nutrients during their first year and if some parents can save a little money by going with Parent’s Choice over Enfamil, they just might. Both formula brands have gentle options or formulas made with the right amount of iron for babies in need. In short, they both offer plenty to infants and parents alike. But before you make your decision on which brand is best for your family, you should probably look at them both a little more closely. The Parent’s Choice Formula brand is the chosen formula to represent Walmart. For parents who already get their groceries and other baby essentials from Walmart, it can be a no brainer to go with the company’s formula too. The Parent’s Choice Gentle Infant Formula with Iron specifically is made for babies prone to fussiness related to gas. Like other bigger name formulas, this particular Parent’s Choice formula can help relieve gas pains thanks to its smaller milk proteins which are easier to digest for tiny tummies. Parent’s Choice has the right ingredients to promote healthy brain development which includes social, cognitive, motor, and communication skills. And those are all important in developing over the first year of your baby’s life. This particular option of Parent’s Choice is a low lactose option, so while it isn’t lactose-free, it can be a lot more gentle on babies’ tummies naturally. Overall, it does have a lot of the same ingredients and benefits as the Enfamil Gentlease, but that is something you will find with most brands side by side. To really know how your baby will take to both of these formulas, you either have to try them both out and see or look at both Parent’s Choice and Enfamil to know for certain. But as far as Parent’s Choice goes, there are a lot of different varieties to choose from. Different Varieties: Parent’s Choice Formula comes in standard Infant Formula, Advantage, Gentle, Sensitivity, Organic, Soy-Based, Tender, Added Rice, Supplementation, Toddler, Next Stage, and Next Stage Vanilla. Key Ingredients: The key ingredients in this particular Parent’s Choice formula are Vitamins A, D, and E, folic acid, iron, and calcium. Available Sizes: It comes in 12, 21.5, and 33.2 ounce containers. Price: on Amazon, a 33.2 ounce container of Parent’s Choice Gentle Infant Formula with Iron is $32. Where To Buy: You can find it on Walmart.com and on Amazon or in store at Walmart. Has This Item Been Recalled? : There are no recent or current recalls on Parent’s Choice Formula. Some parents will really appreciate the cost value that Parent’s Choice formula offers. It can be a lot more convenient to buy the formula in-store when grocery shopping, whereas grocery store availability of other formulas could be lacking. This particular Parent’s Choice formula is made with most of the same ingredients and nutritional benefits as other bigger name brands. Your little one can get everything he or she needs during their first year as far as physical and mental development go. The smaller proteins make it easier for babies to break down this particular formula. Some babies may get constipated from this formula, though that can vary from baby to baby. Others might even get diarrhea, which can be a whole other problem for babies and parents alike. Some babies may not take to the taste of this one, which can also make it a no-go. “I was using Enfamil up until about a month ago for our now four months old. Enfamil is more expensive than Parent’s Choice. I decided to try Parent’s Choice and I looked at the ingredients and they were the same as Enfamil. Our son has been using Parent’s Choice and it has been wonderful while being less expensive. We love Parent’s Choice!” – Toya on Walmart.com. “Our baby wasn’t doing well on Similac, as it was making him spit up more. I tired the gentle version of Parent’s Choice and he has been fine since. The ingredients are nearly identical to all the major brands. My doctor told me it was the same so why not save money?” – Hutch on Walmart.com. As far as most parents are concerned, Enfamil Formula is arguably one of the leading brands in formula today. The brand is home to a ton of different kinds of infant formula for virtually any special dietary needs your baby might have. Enfamil even has a pre-mixed toddler formula to give your toddler continued nutrition well after he or she has moved on from the Enfamil infant formulas. But until that time comes, whether your little one needs a gentle formula to be able to better digest it during and after feedings or a formula that’s even closer to breastmilk to put your mind at ease, Enfamil has something for your little one. But one of the most commonly sought after kinds has got to be the Enfamil NeuroPro Gentlease Formula. It is formulated to promote overall healthy immunity in babies and has all of the nutrients needed for proper development in the first year. 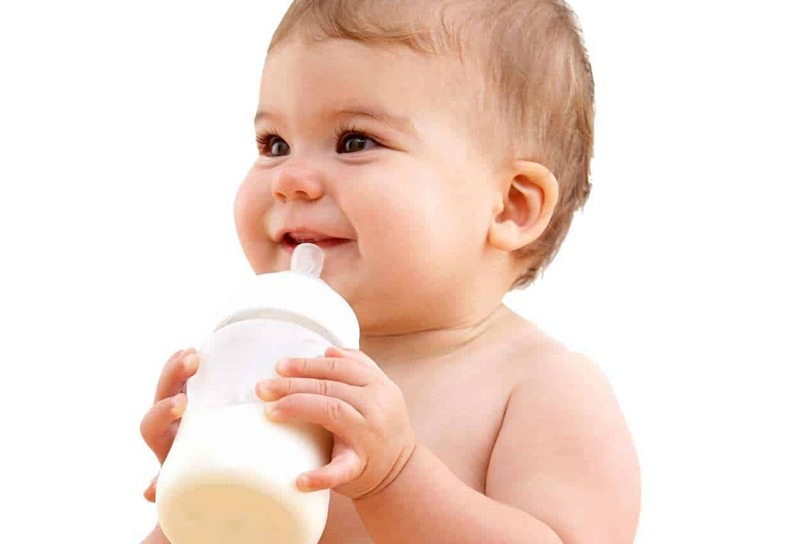 It is also made with smaller proteins so that your baby can more easily digest the formula and can avoid the common issue of gas buildup and discomfort. This formula is also made with MFGM and DHA for healthy brain development and is close to what your baby would get from breastmilk. Your baby can start with this particular Enfamil formula right from the start and use it for the entire first year of his or her life. Different Varieties: Enfamil comes in a lot of different varieties, including NeuroPro, NeuroPro Gentlease, Premium Newborn, Enspire, Reguline, ProSobee, and Toddler Transitions. Key Ingredients: The most notable ingredient is MFGM, which was previously found only in breastmilk, but in this case was taken from cow’s milk to help support proper brain development. Available Sizes: This particular Enfamil formula comes in 20 ounce containers or single serving formula packets. Price: On Amazon, a 20 ounce container of Enfamil NeuroPro Gentlease Formula is $28. Where To Buy: You can find it on the manufacturer’s website and on Amazon or in store at Target. Has This Item Been Recalled? : There was a 2018 recall of some Enfamil products. The overall smell is a lot less strong than that of other similar formulas, so some babies might take to it more quickly. Thanks to the smaller proteins, the Enfamil formula is easier to digest for little tummies. It comes in so many different varieties, including one for babies who need soy milk as opposed to cow’s milk formula. The nutritional values are as close to breastmilk as you can get without the real thing. It is a little pricier than the Parent’s Choice Formula. The NeuroPro Gentlease might cause constipation or diarrhea in babies, but it can vary from baby to baby. Some parents might not love that one of the ingredients is corn syrup solids. “I think it is working great, my daughter is always fussy and gassy after drinking formula but with the Enfamil Gentlease Neuropro she seems to not have as bad gas as with others, I think I will be switching her over to this formula and really looking forward to seeing more benefits, overall I would recommend!” – Jackie Sutherland on Amazon. “Only formula my baby can handle without major belly pain or complications, was easy to start supplementing after breastfeeding for five months, and she did not reject it like other formulas! Happy baby, happy momma.” – Kristina Wittenberg on Amazon. “This formula helped my daughter within 24 hours. She went from crying from gas pains to being content. This formula is great.” – Tiffany Ward on Amazon. When it comes down to it, you can’t ignore that it is a little difficult to choose the better option between the Parent’s Choice and Enfamil Formulas. But to be honest, Enfamil takes the cake here. It may be a little more costly in every variety it comes in, but you get what you pay for. By spending a little extra on Enfamil, you get formula full of vitamins and nutrients your baby needs for the healthiest development possible during his or her first year. That’s not to say that Parent’s Choice formula isn’t also healthy and beneficial to your baby, because it certainly is. But there is something so convenient about going with a brand of formula that you can grab at almost any store or pharmacy rather than one you have to travel to a specific store for. And while some parents might see little change in their baby from switching from one of these formulas to the other, if convenience is what you’re after for a few extra dollars, then Enfamil is the way to go. Contrary to what some parents might claim, name brands are not always best when choosing baby formula or baby products in general. There is nothing wrong with opting for store brands or generic options if that suits your family better. But in this case, the stronger option between Parent’s Choice and Enfamil formulas is going to be Enfamil. There is always the chance that Parent’s Choice works better for your infant and that’s totally fine, but you might want to try out Enfamil on his or her tummy first. Aptamil vs Enfamil Formula - Which Is Better?